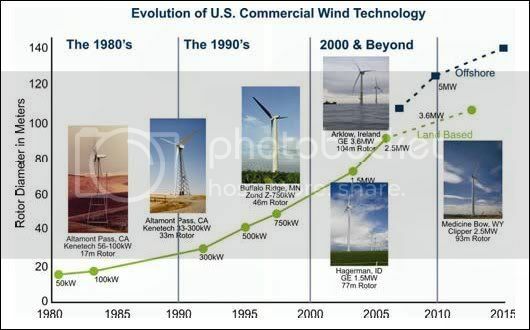 Home » Blogs » Tony Wikrent's blog » Can the U.S. achieve 20% wind energy by 2030? Can the U.S. achieve 20% wind energy by 2030? On Monday, May 12, the U.S. Department of Energy released its long-awaited report on wind energy 20 Percent Wind Energy by 2030. Fortunately, two weeks ago the American Wind Energy Association (AWEA) accepted my media credentials from epluribusmedia.com, allowing me to attend a special seminar and workshop in Des Moines, Iowa, on the supply chain problems and opportunities of an incipient boom in wind generated electricity. 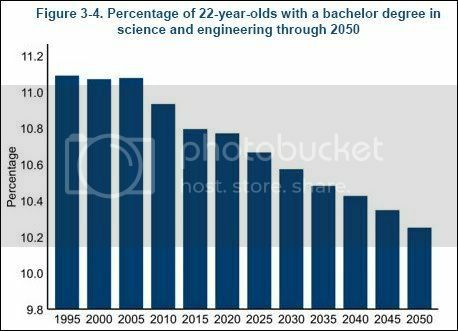 Wind has the potential to meet most if not all of U.S. electricity needs within the next two to three decade, if - IF - we can surmount significant obstacles caused by the “post-industrial” neglect and withering of the U.S. manufacturing base. Contrary to the unrealistic beliefs of many who yearn for clean energy, heavy industry is absolutely essential to the development of wind powered electricity generation. For example, 114 tons of steel are required for every megawatt of wind energy installed. In fact, the wind turbines now being developed and brought on line are mammoth industrial projects, that dwarf a Boeing 747 passenger jet in size. But only half the content of a wind turbine can now be made in the U.S. We are at the dawn of a new age of clean, renewable energy, but if we are to realize the full potential of this new era, there is no getting around the need to rebuild U.S. heavy industry and manufacturing. First, let’s get an idea of the scale we’re talking about. The photo below is of a 1.5 megawatt (MW) wind turbine generator built by Suzlon, a company that began in India not that long ago, in 1995. As you can see, these wind turbines are not your grandfather’s windmills. If you look closely, you will see there are two technicians standing atop the nacelle which is a surprisingly large and crowded working space crammed full of heavy machinery, including the actual generators that produce electricity. The next two pictures are from the presentation by Daniel Laird, of Sandia National Laboratories. 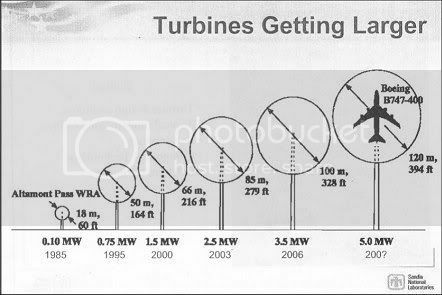 They show how wind turbines have grown in size and capacity from the first Kenetech wind turbines developed and deployed in California in the late 1970s and early 1980s. Laird noted that while the modern wind turbine was developed in the 1970s in California, a lack of interest and support by the federal and state governments allowed the cutting edge of wind technology to shift to Europe in the 1980s and 1990s. Encouraged by a more stable investment climate deliberately created by favorable government policies, a number of European companies emerged, which have increased the size of a typical commercial wind turbine from about 20 meters in tower height to 100 meters; from 25-30 meters rotor diameter to 70-100 meters; and from 100 kilowatts (KW) electricity output from to 5 megawatts (MW). Today, the country with the most installed wind turbine capacity is Germany, with 22,247 MW. By installing a record 5,244 MW of new wind generated electricity capacity in 2007, the U.S. grew to 16,618 MW (just under 17 gigawatts or GW), overtaking Spain’s 15,145 MW to take second place. AWEA is proudly boasting that 2007 is the first year over one percent of U.S. electricity production was wind generated. Today, the optimum size for land-based wind turbines appears to have settled at 1.5 MW to 2.5 MW, while offshore wind turbines of up to 5 MW are now being developed, deployed and tested. Wind turbines over 2.5 MW are simply too large to be moved and constructed on land. Jim Walker, Vice President of renewable energy development company enXco and President-Elect of AWEA, noted that if U.S. installed capacity were the same as Germany’s per capita, the U.S. would have 43 gigawatts (GW) of wind turbine capacity installed now, instead of 17 GW. 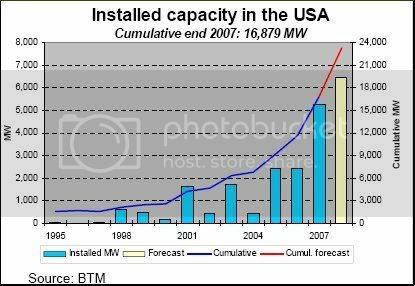 And if the U.S. had the same capacity as Germany per unit of land area, the U.S. would have 320 GW installed now. The state with largest amount installed is Texas, but it is Iowa that leads in proportion of total electricity produced by wind, with 5.5 percent. And if a transmission system would be put in place, Iowa could export four times the total electricity it needs. Montana and the Dakotas alone have enough wind energy potential to supply the entire U.S. demand for electricity. The new U.S. Department of Energy report “20 Percent Wind Energy by 2030,” – eagerly previewed by a number of speakers who contributed to it - calls for wind to supply 20 percent of U.S. electricity by the year 2030, a mandate laid down by President Bush's Advanced Energy Initiative announced in the 2006 State of the Union Address. The report pegs the cost at only a two percent marginal difference in the approximately $2.4 trillion the U.S. needs to invest to meet projected electricity demand of 2030. When determining whether it is more efficient to site wind projects close to load or in higher quality wind resources areas that are remote from load and require transmission, the WinDS optimization model finds that it is often more efficient to site wind projects remotely. In fact, the model finds that it would be cost-effective to build more than 12,000 miles of additional transmission, at a cost of approximately $20 billion in net present-value terms. Much of that transmission would be required in later years after an initial period where generation is able to use the limited remaining capacity available on the existing transmission grid. 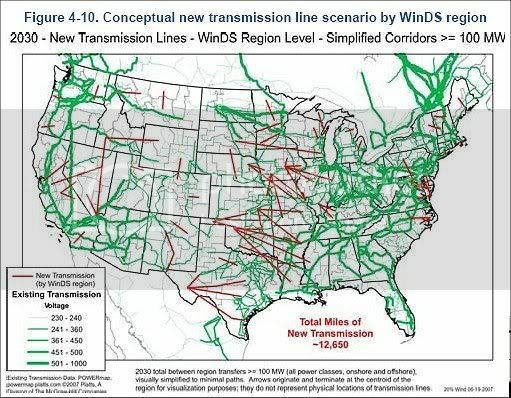 Transmission required for the 20% Wind Scenario can be seen in the red lines on the map in Figure 4-10. The red lines represent general areas where new transmission capacity would be needed, in addition to the existing transmission grid illustrated by green lines. As a point of comparison, more than 200,000 miles of transmission lines are currently operating at 230 kV and above. It is only since 2005 that the United States has become the world’s largest market for new wind turbine generators. In 2007, the nearly 6 MW of new wind power accounted for 35 percent of all new electricity generating capacity installed in the U.S. (wind was second only to new power plants burning natural gas). To achieve 20 percent wind by 2030, the construction of new wind turbine generators needs to be increased five-fold. But there simply is not enough manufacturing capacity to build new wind turbines at that rate. Already, crucial manufacturing shortcomings in certain wind turbine components are limiting production and creating a rapidly growing backlog of orders. Randall Swisher, Executive Director of AWEA, told workshop attendees that if you ordered a new wind turbine generator today, you would have to place a sizable deposit in cash, and wait at least two years for delivery. This was confirmed by a number of other speakers. In 2007, there were 3,188 new wind turbines installed in the United States, for an additional 5,244 MW capacity. These required 9,564 rotor blades; 17,425 miles of steel rebar, between two and three percent of total U.S. steel production, and 805,000 cubic yards of concrete. The total weight of a wind turbine is 230 to 340 tons. 89.1 percent of that is steel. 5.8% is glass-reinforced plastic (almost all for the rotor blades); 1.6% is copper, 1.3% concrete, and 1.1% is adhesives. The remaining 0.4% is aluminum and various other materials. These ratios are expected to shift slightly as designs are refined and new materials, such as advanced permanent magnets, are introduced. The cost of a typical wind turbine is 80 to 85 percent equipment; construction 8 to 9 percent; construction labor 1 to 2 percent; and other 5 to 6 percent. The other includes substation, interconnection, and payments to land owners. A 2006 report by the Renewable Energy Policy Project, Wind Turbine Development: Location of Manufacturing Activity, lists 21 major components for a wind turbine. The report identifies the associated six-digit North American Industrial Classification System (NAICS) code for each component, and provides technical descriptions of each part. 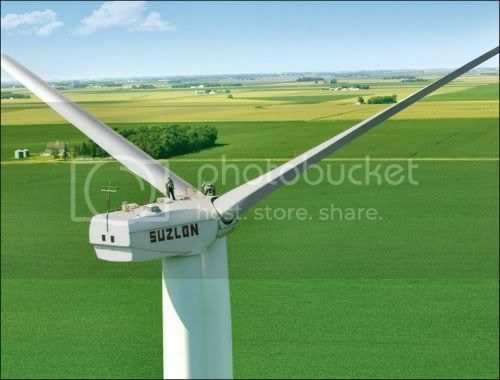 Wind turbine design has generally settled on a rotor with three blades as providing the best balance of high rotation speed, load balancing, and structural and construction simplicity. The main shaft of a wind turbine is usually forged from hardened and tempered steel. Hardening and tempering is a result of forging the axle after it has been heated until it is white-hot at about 1000 degrees centigrade. By hammering or rolling the blank is formed with an integral flange, to which the hub is later bolted. The shaft is reheated a final time to a glowing red, following the forging process, and then plunged into a basin of oil or water. This treatment gives a very hard, but at the same time rather brittle surface. Therefore the axle is once again reheated to about 500 degrees centigrade, tempering the metal and thereby enabling the metal to regain some of its former strength. describes the raw materials required to reach manufacturing levels of about 7,000 turbines per year. This analysis assumes that turbines will become lighter and annual installation rates will level off to roughly 7,000 turbines per year by 2017 and continue at that rate through 2030. Approximately 100,000 turbines will be required to produce 20% of the nation’s electricity in 2030. Page 67 of 20 Percent Wind Energy by 2030 is a map and complete list of all the manufacturing facilities in the U.S. that produce components for wind turbines. Raw materials are not a problem – with one exception, noted below. Just three years ago, only 20 percent of the content of a wind turbine was manufactured in the United States. At the AWEA workshop, speakers noted that the U.S. is now near providing fifty percent of the content. However, there are some components for which the U.S. has no production capacity at all – most notably generators. Even GE Wind Power is importing wind turbine generators from abroad. Another major shortage is in skilled personnel. Britt Theisman of AWEA noted that wind turbine generator operations and maintenance service providers have not fully matured yet, and that most turbines are still under the warranty of their manufacturers. Currently, the U.S. has about 2,500 people trained for wind turbine operations and maintenance, but the 20 by 2030 goal will require 70,000. Most gearbox failures do not begin as gear failures or gear-tooth design deficiencies. The observed failures appear to initiate at several specific bearing locations under certain applications, which may later advance into the gear teeth as bearing debris and excess clearances cause surface wear and misalignments. Anecdotally, field-failure assessments indicate that up to 10% of gearbox failures may be manufacturing anomalies and quality issues that are gear related, but this is not the primary source of the problem. A major factor contributing to the complexity of the problem is that much of the bearing design-life assessment process is proprietary to the bearing manufacturers. Gearbox designers, working with the bearing manufacturers, initially select the bearing for a particular location and determine the specifications for rating. The bearing manufacturer then conducts a fatigue life rating analysis to determine if the correct bearing has been selected for the specific application and location. Generally, a high degree of faith is required to accept the outcome of this analysis because it is done with little transparency. Joshua Magee, Research Director of Emerging Energy Research, a leading advisory and consulting firm on new energy technologies, noted that it is unlikely that any bearing manufacturer will devote itself exclusively to designing and manufacturing bearings for wind turbines, and that it is also unlikely that any wind turbine manufacturer will seek to include a bearing manufacturer in any plans for vertical integration. Leif Anderson of Suzlon said that wind turbine manufacturers can no longer expect to simply buy standard bearings. According to BTM Consult ApS, because of the many problems experienced with bearing failures, wind turbine manufacturers are wary of obtaining bearings from other than the two leading suppliers of large bearings, SKF of Sweden, and Schaeffler FAG / INA of Germany. The lead time for delivery of large bearings is up to 12 to 18 months. 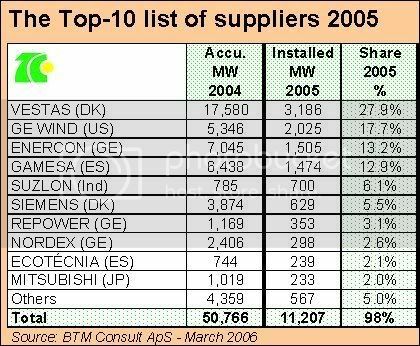 In its December 2006 report, International Wind Energy Development: Supply Chain Assessment 2006-2010, BTM Consult ApS forecast world gearbox production capacity to increase from 15,000 MW in 2006, to somewhere between 21,435 and 32,150 MW by 2010. The largest gearbox maker in the world is Winergy, owned by Siemens, with around a third of the market. The next largest, with around a quarter, is Hansen Transmissions, a Belgian firm which was acquired by Suzlon a few years ago. The next two, with about a tenth of the market each, are Moventas (known as Metso Drives until 2005, located in Finland) and Bosch Rexroth, the result of a 2001 merger of a gear division of Robert Bosch GmbH, and Lohmann & Stolterforth, a division of Mannesmann Rexroth AG. 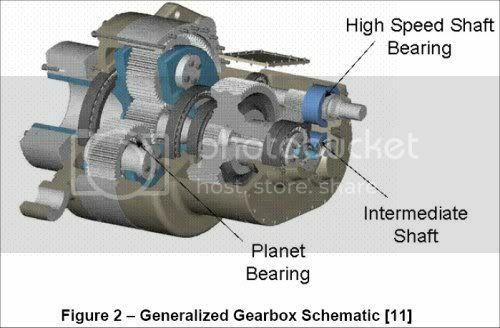 The remaining gearbox manufacturers are Eickhoff GmbH (Germany), Echesa (Spain), Hyosung (South Korea), Chongqing (China) and Mitsubishi (Japan). Some of these companies have manufacturing facilities in the U.S., however only seven percent of world gearbox production capacity resides in North America. At the AWEA workshop, Lars Moeller of Broadwind Energy (which began as TowerTech Holdings) described his firm’s recent acquisition of eight-decade old Brad Foote Gear Works, of Cicero, Illinois, and highlighted Broadwind’s goal of becoming the premier supplier of components for wind energy in North America. On April 22 Broadwind Energy announced that Brad Foote Gear Works had signed a three year contract with GE Transportation to provide gear sets for use in wind turbine gearboxes built in Erie, Pennsylvania. The announcement noted that the gearing components will be produced in Brad Foote's new 270,000 square foot facility, which nearly doubled Brad Foote's manufacturing space to about 600,000 square feet. A surprisingly large number of gearbox failures have been traced back to design and manufacturing problems. The Steel Wind project, built on a former Superfund site of a decrepit steel mill in Lackawanna, New York, just south of Buffalo, produces a total of 20 MW, with a series of 2.5 MW Liberty turbines, produced by Clipper Wind, a subsidiary of the British company Clipper Windpower Plc. Each Liberty turbine has four generators in the nacelle, behind a very complex gearbox. 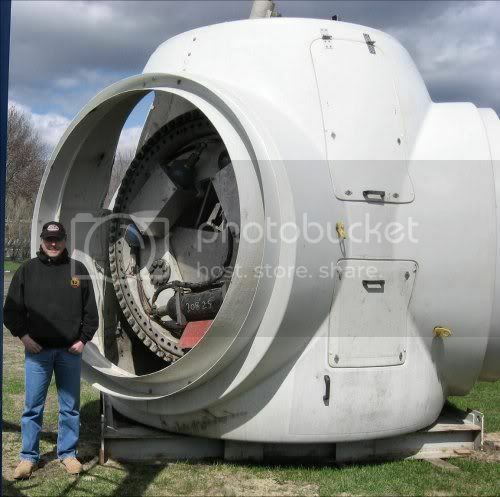 These turbines were manufactured in late 2006 at Clipper Wind's new 330,000-square-foot facility in Cedar Rapids, Iowa, and placed in operation at the Lackawanna shore of Lake Erie in April 2007, according to Clipper's Web site. Problems with the turbines’ gear boxes have already resulted in Clipper temporarily shutting down all but two of them. Clipper found that the problems resulted from incorrect timing of the gear sets, and has made the necessary quality control corrections to its manufacturing process. Cut-away drawing of the drive train and four generators in the nacelle of the Clipper 2.5 MW Liberty Wind Turbines. 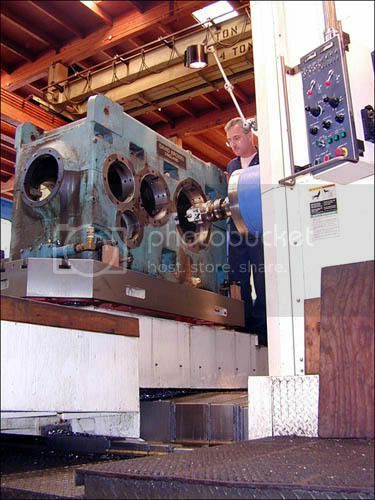 The following two pictures are from the special Wind Turbine Photo Gallery web page of The Gear Works, a gear manufacturing facility specializing in precision gear products and power transmission services in Seattle, Washington since 1946. These photos show the scale of the industrial operations involved in manufacturing and rebuilding wind turbine components. And these are relatively small gearboxes, for wind turbines rated in the hundreds of kilowatts, compared to the gearboxes used in the larger megawatt-rated wind turbines. 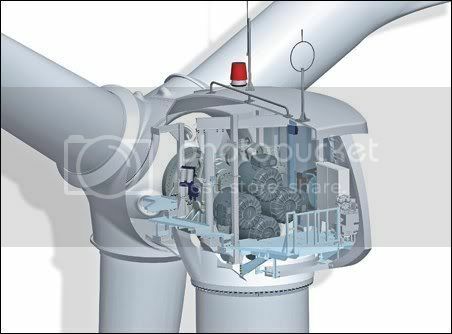 Bosch Rexroth has a particularly excellent picture of the internal components of a wind turbine on its web page of Gear Technology and Hydraulics for Wind Turbines. I recommend spending a few minutes there clicking on some of the components in Bosch Rexroth’s Flash presentation. At present, the U.S. imports all its generators for wind turbines. 70% of the world’s generators for wind turbines are produced in Europe, and the remainder in Asia. None are produced in the United States, not even by General Electric, which, according to BTM Consult ApS, buys them from VEM Sachsenwerk GmbH of Germany, and Winergy / Loher GmbH, also of Germany. 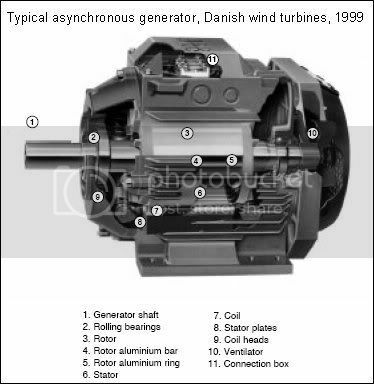 Of all the wind turbine makers, only Vestas and Enercon produce their own generators. Don McDivott of Spanish wind turbine maker and operator Acciona noted that the metallurgy of ductile iron in large castings has proven to be a great challenge. 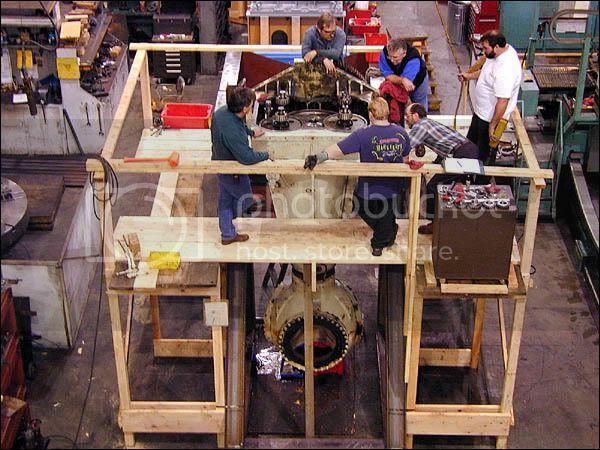 The hub, to which are bolted the rotor blades, and the mainframe of the nacelle, to which are bolted the gearbox, generators, supports for the mainshaft, electronic control panels, and so on, are two large components that must be cast. 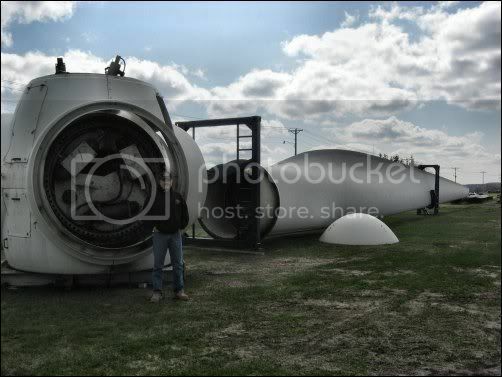 For a 1.5 to 2.0 MW wind turbine, the hub and the mainframe each weigh eight to ten tons. The writers of the DOE report on 20 percent wind by 2030 are optimistic that the U.S. can easily mobilize the industrial capacity to meet the needs of this program, based on how successfully Toyota was able to build and grow auto manufacturing capacity in the U.S. Using Toyota as an example is an interesting irony, because as the five-year study of the world auto industry conducted in the mid-1980s by the Massachusetts Institute of Technology, showed, Toyota had very unique management characteristics that are not shared by its U.S. industrial counterparts. Led by James Womack, the MIT study was released as the national bestseller The Machine That Changed the Word: The Story of Lean Production, and it showed that because Toyota and Japanese auto makers in general were much more respectful of their employees and suppliers, they benefited greatly from suggestions that originated on the factory floor. By contrast, the management of U.S. auto makers were aggressively hostile toward their workers and suppliers, and scoffed at the notion that workers on the factory floor could offer any meaningful contribution other than their brute, raw, physical labor. One statistic tells it all: U.S. workers at Chrysler, Ford, and General Motors plants in the U.S. submit 0.4 suggestions per worker per year; U.S. workers at Japanese plants in the U.S. submit four times as many, or 1.6 suggestion per worker per year. But each Japanese worker in a Japanese car plant in Japan submits an astonishing 64 suggestions per year. In other words, the Toyota system of production is 160 times more efficient than U.S. mass production at mobilizing the creative powers of human ingenuity at the lowest level of production. Workers may suggest small, incremental changes, but over time and given a large enough number, they can make for impressive results: at the time of the MIT study, Toyota could produce over 50 cars per employee each year, compared to only the 10 or 15 cars produced per each employee per year by U.S. automakers, and Toyota’s defect rate was one third that of the U.S.
U.S. automakers have striven mightily to catch up to Japanese levels of efficiency, productivity, and quality, but some two decades later, still lag behind. For over 20 years, U.S. automakers and U.S. industry in general have tried implementing a number of facets of the Toyota “lean production” system, such as just-in-time inventory control and concurrent design and production, but they have stubbornly refused to do anything but give lip service to “valuing their human assets.” If anything, the United States economy and society have become more stratified and more ossified since the MIT study, with the arrogance and disdain of top management readily evident in the multi-million pay packages executives extract even while they drive their companies into the ground. It is doubtful that U.S. manufacturing capacity can be ramped up as rapidly and as easily as the DOE report writers would like to believe, without a serious attempt to honestly confront the anti-worker and anti-industry prejudices of U.S. managers, financiers, and environmentalists. James Crotty, Professor of Economics at the University of Massachusetts / Amherst explains how the financialization of the U.S. economy – today, the equivalent of total U.S. Gross Domestic Product is traded in financial markets once every two to three days, compared to once every nine months in the early 1960s – has overwhelmed “patient” finance and allowed impatient financial markets to raise real interest rates, forcing nonfinancial corporations (NFC) to pay an increasing share of their cash flow to financial agents, drastically changing managerial incentives, and radically shortening NFC planning horizons. 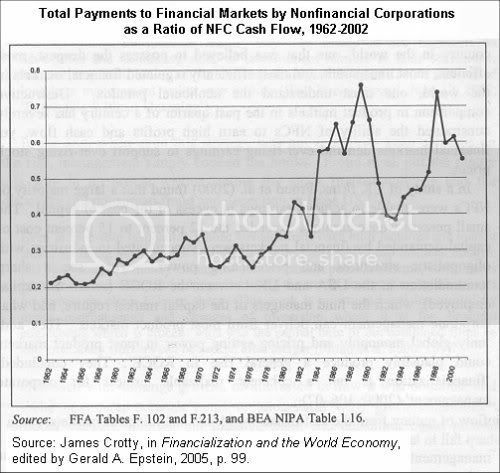 The result has been that over the past three decades, over half of NFC cash flows have been redirected to payments to financial markets, forcing industrial companies to rely on debt for expansion rather than self-financing. Source: Source: James Crotty, in Financialization and the World Economy, edited by Gerald A. Epstein, 2005, p. 99. Warren Buffett makes exactly the same point in his 2006 letter to Berkshire Hathaway shareholders, where he relates the little parable about the Gotrocks, showing how the financial system continues to grow and grow eating up more and more of the real economy. While the Arab world is far far behind the US now, a generation of sending them all our money can equalize things. There is no reason in genetics, society or science that the Arab world cannot become technically and economically capable of destroying the West, given enough money and time. BTM Consult ApS forecasts the world’s cumulative installed wind turbine electricity capacity to triple from 59,264 MW in 2005 to 148,794 MW by 2010, with the strongest growth in Asia, particularly India and China. AWEA and others are keen to point out that continued growth in the United States depends on Congressional approval of Production Tax Credits (PTCs) for building wind turbine generators. Unlike Europe and Asia, the growth of U.S. wind power has been uneven and subject to severe downturns that have made manufacturers wary of investing in expanded production capacity. The dramatic collapses in new capacity installed for the years 2000, 2002, and 2004, seen in the graph below, shows the results of lack of government support. In those three down years, Congress allowed PTCs for wind energy to lapse without renewing them. David Drescher, vice-president of John Deere Wind Energy, a subsidiary of John Deere & Co. that develops major wind energy projects, told the AWEA work shop that PTCs account for one third of the revenues generated by a wind project in its beginning years. Drescher and a number of other speakers pointed out that in the U.S., PTCs for wind energy merely “level the playing field,” given the extensive government support enjoyed by the oil, coal, gas, and nuclear power industries. The current PTC, which has given us two historic annual increases in wind power capacity, will expire on December 31, 2008, and partisan conflict in both the House and Senate over how to pay for a new PTC are preventing movement forward. Here is another weakness of AWEA and the wind energy: the failure to squarely face the fact that the conservative ideology behind the Bush / Norquist tax cuts are bankrupting the country by grossly distorting financial rewards and flows, making it near impossible to plan for and implement goals and objectives of national importance. Perhaps one of the most important things an individual can do is to contact his or her Congressman and Senators, and demand a new Production Tax Credit for wind energy that will cover more than just one or two years, thereby providing some incentive and assurance for wind turbine manufacturers and the component manufacturers to begin vastly expanding their production capabilities. Many speakers also emphasized the importance of Renewable Portfolio Standards (RPS), which mandate that by a certain date a specified percentage of electricity must come from renewable sources such as wind. So far the federal government has not adopted a RPS, but over half the states have, with California, Texas, and Iowa leading. In addition, distributed wind technology is limited by the heights it can reach. 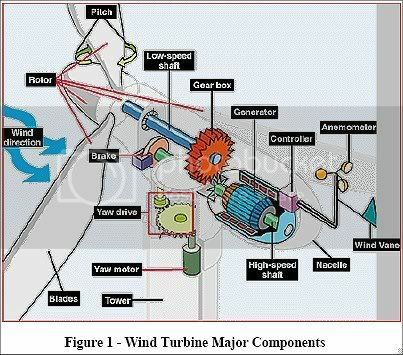 The power of a wind turbine is related to wind speed cubed, and the higher the altitude you can reach, the higher the wind velocity you find, and the bigger the power payoff you therefore achieve. 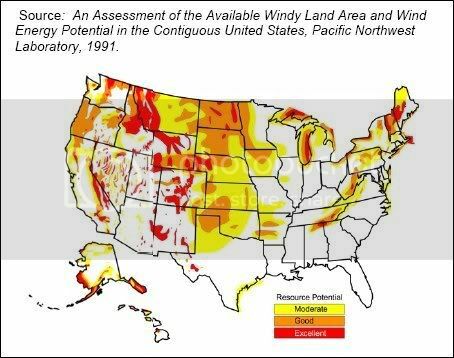 Low altitudes in particular are a problem, because vegetation, topography, and man-made structures have enormous negative effects on wind at low altitude when it comes to generating power. AWEA is holding its premier event, the WINDPOWER 2008 Conference & Exhibition, June 1-4 2008, in Houston, TX. Note: I would like to thank Professor Ahmad Hemami and Program Director Al Zeitz of the Wind Energy and Turbine Technology Program at Iowa Lakes Community College in Estherville, Iowa, for taking the better part of an afternoon to introduce me to the technical fundamentals of wind industry. It was Professor Zeitz who told me about the American Wind Energy Association special supply chain seminar and workshop. for the windpower during election years vs non-election years? I couldn't resist but back to the serious side, very nice write up Tony!